It’s migration season and breeding season so birds are very active right now. Our yard is full of sights and sounds of spring. 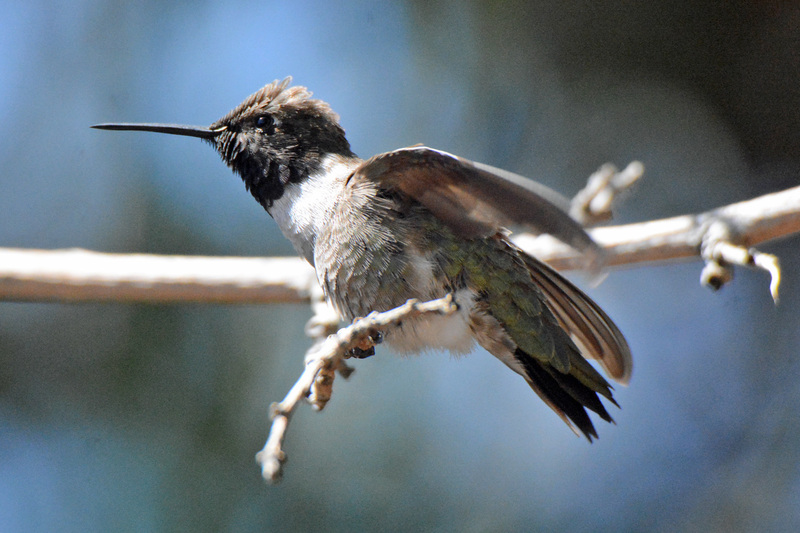 There is lots of territorial aggression going on at the hummingbird feeders. 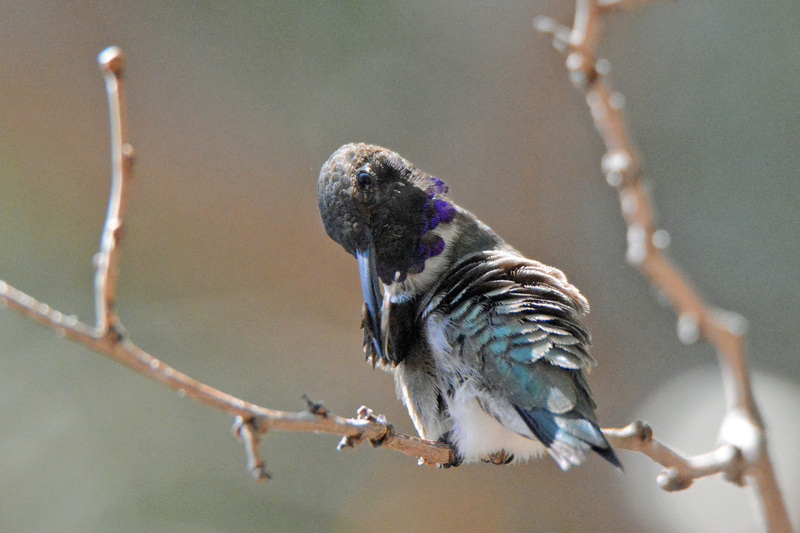 The rare Broad-billed Hummingbird stayed for 3-4 weeks but she has now moved on. 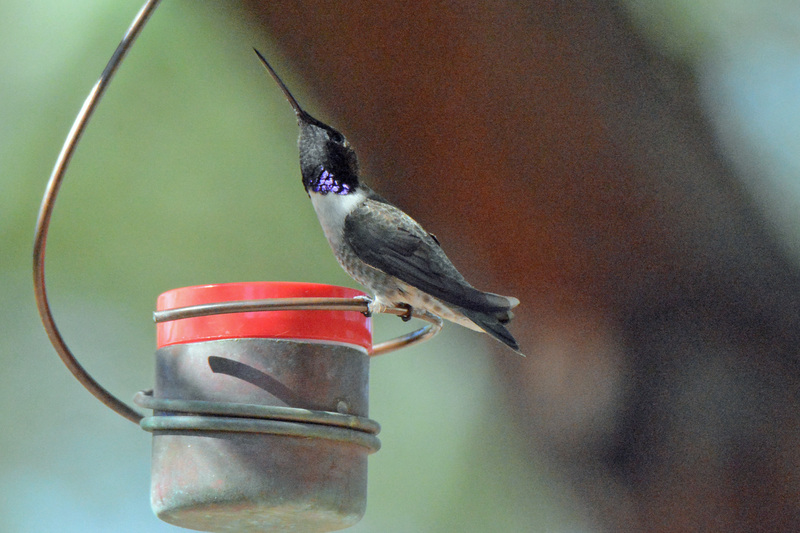 We now have at least 3 Black-chinned Hummingbirds (2 males). I assume some may be the same ones who have come for the last few years because they always come from about March-May. 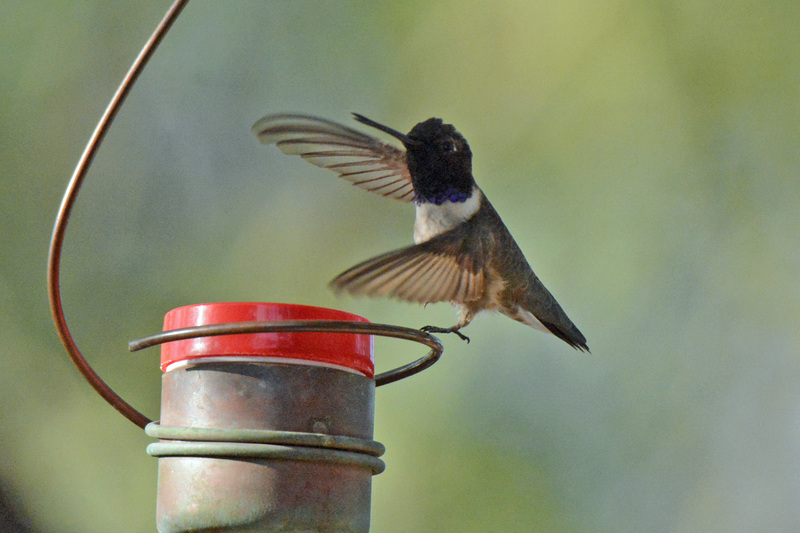 The males are very aggressive around the feeders and chase each other and the several Anna’s hummers all over. Fortunately, there are 4 feeders so everyone is able to get a turn eventually. 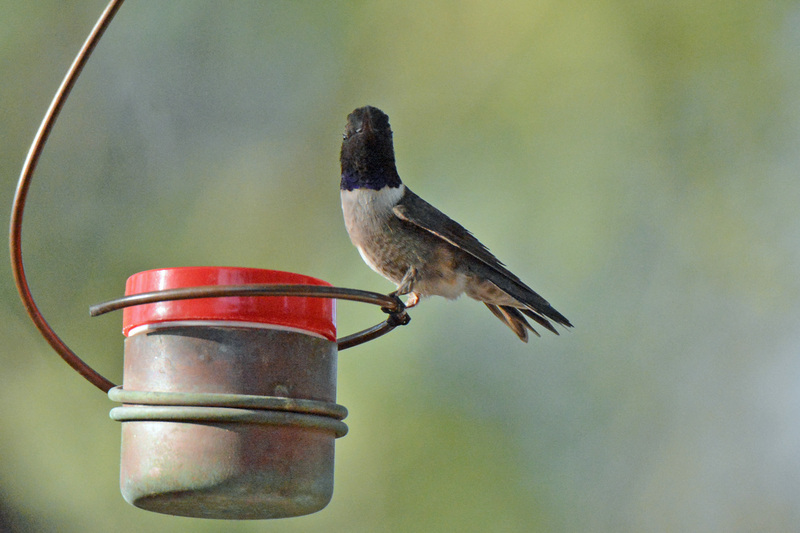 The Black-chinneds make a funny, buzzing sound, totally different from the sound of an Anna’s. The sun has to hit them just right to make the males’ purple collars visible so it’s a fun challenge to try. This is the female, below. 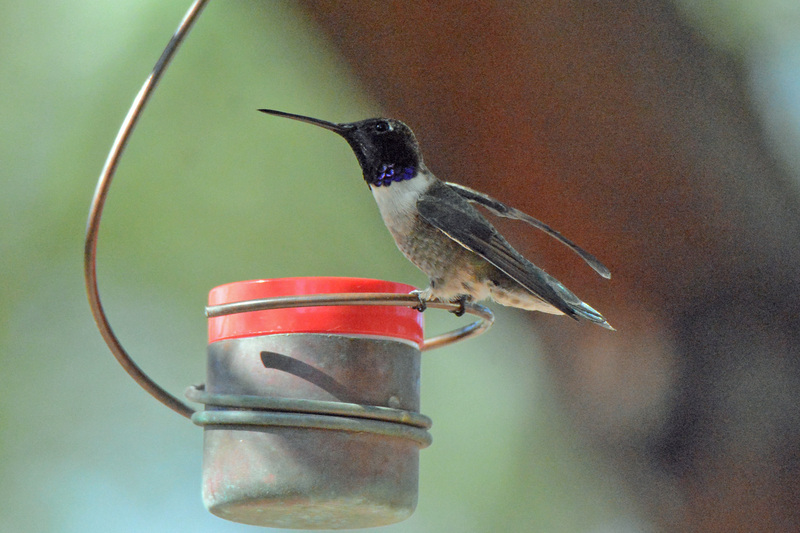 She is lankier with a whiter underside than the Anna’s Hummingbirds. They also have longer, slightly down-curved bills. We have at least 3 in our yard. They are here year-round, desert birds. My favorite bird in the world, “Tink,” is still here. She usually leaves by the second week of March but I’m afraid she’s hooked on grape jelly and doesn’t want to leave. Everything I’ve read said that having food out doesn’t affect migration so she will probably leave soon. I finally caught a glimpse of her orange crown a few days ago (you can see it in the last photo, above). It isn’t normally visible. This is her 4th winter in our yard so I hope she’ll have a safe summer and come back next year. These guys will probably be migrating soon, too, although some do stay year-round, apparently. We’ll see. They don’t really seem to be a couple. I see the male (“Chatty”) all the time and he likes to follow Tink around rather than the female of his own species (“Shy Girl”). I’m hoping we’ll get a few more migrants coming through, someone new and exciting, maybe. I haven’t had much luck lately getting new birds. 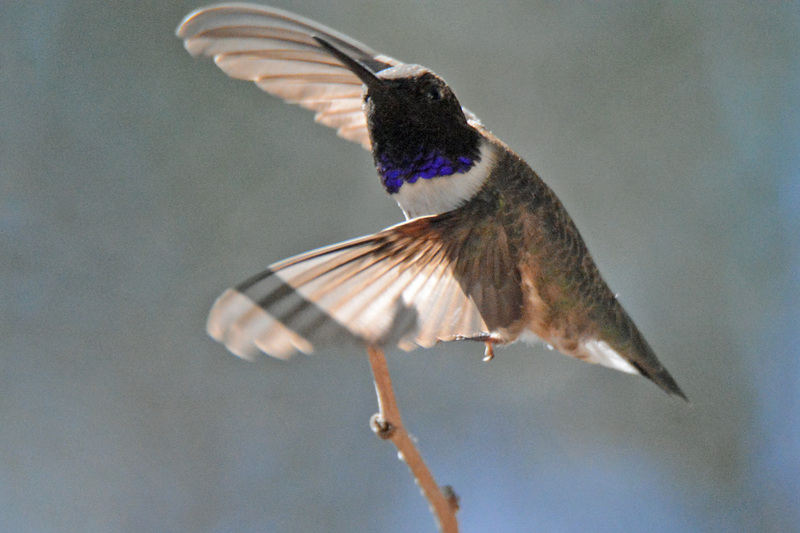 This year’s Great Backyard Bird Count was held from February 15-18, sponsored by National Audubon Society and Cornell Lab of Ornithology. My birder friend, Karen, and I were going to go out that Saturday but she was sick so that didn’t happen. It was a gloomy weekend and, finally, on Monday, I wanted to have something to report on eBird.org so I sat in the yard for awhile. Here are some of the birds I saw. Most photos were taken on that day. He has been in my yard for the last several weeks but on the day of the count, a female of his species also showed up, just to get counted! I have seen her a couple times since then, too, very cute. Altogether, I saw 16 species in the yard that day in about an hour and a half. Those photos were taken at Desert Botanical Garden a couple weeks ago when I took a friend there. Aren’t they gorgeous? 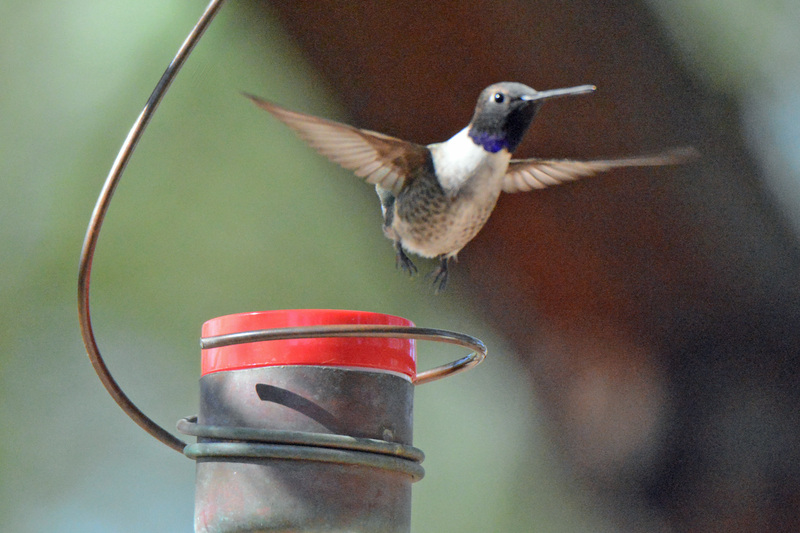 Of course, all hummingbirds are beautiful. The one below is an Anna’s female, you can see how different she looks from the Broad-billed female. An amazing thing happened just before I took these photos. A hawk (Sharp-shinned, I think, but I didn’t get a photo) crashed through the mesquite tree where the feeders are looking for a snack, I guess. I know they need to eat but I was pleased it came out empty-taloned. It then landed on my neighbor’s garage while I ran in to get the camera and it took off just as I tried to get a shot. I really hope it gets its meals somewhere other than our yard…so does Tink. 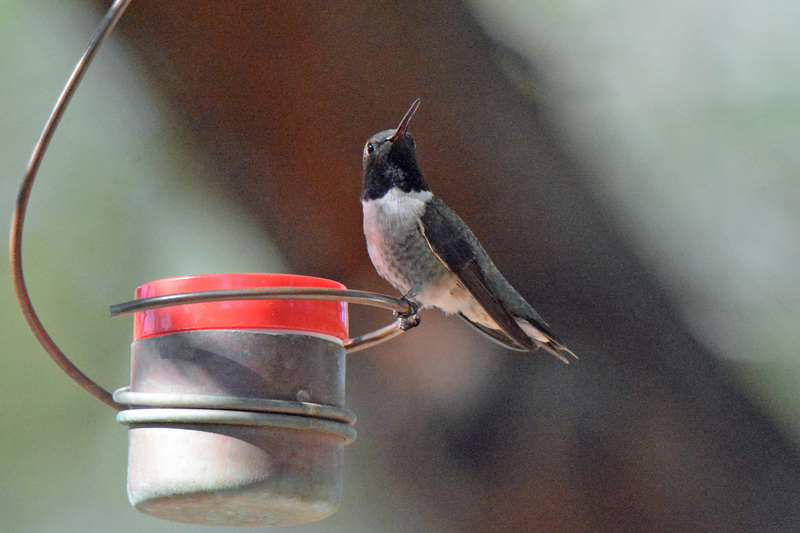 Tink has a new member of the Warbler family also visiting in the yard and also loving the grape jelly she loves. She doesn’t seem too fond of him, though. He chases her and is very chatty at times so she has moved over to the other jelly feeder. It’s been really cold here, freezing at night, so many of the plants are covered up. The outdoor kitties have a lot of extra blankets and towels in their beds (and a new igloo but it only fits one, unfortunately) and the birds are bundled up.